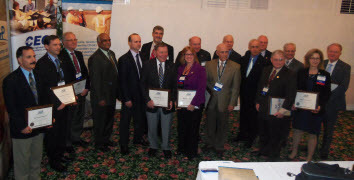 ASCE’s Academy of Geo-Professionals inducted 38 recipients of the Diplomate in Geotechnical Engineering (D.GE) certification at a ceremony at the 2013 Geo-Institute Congress in San Diego, California, on March 4. A Diplomate is a board certified professional, and the credential is considered one of the highest designations in the geotechnical profession, with fewer than 250 engineers achieving the D.GE status. To earn their D.GE, each member of the new class had to have at least 8 years of experience after earning a P.E. license, earn a master’s degree or equivalent, and demonstrate advanced knowledge in at least 1 area in geotechnical engineering, and pass a board examination (or demonstrate sufficient eminence in the field to qualify for a waiver of the exam requirement). The Academy of Geo-Professionals was founded in October 2008 by the members of ASCE’s Geo-Institute with the goal of providing advanced certification to geotechnical engineers. The first certifications were awarded in March 2009. 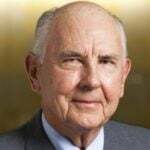 Joseph Francis Callanan, P.E., D.GE, F.ASCE, Geotechnology, Inc.
James G. Collin, Ph.D., P.E., D.GE, F.ASCE, The Collin Group, Ltd.
Elizabeth M. Dwyre, P.E., D.GE, M.ASCE, Parsons Brinckerhoff, Inc.
Raymond J. Franz, P.E., D.GE, M.ASCE, Hayward Baker Inc.
Stephan M. Gale, P.E., D.GE, F.ASCE, Gale-Tec Engineering, Inc.
Aaron Goldberg, P.E., D.GE, M.ASCE, S&ME, Inc.
Tom Gurtowski, P.E., D.GE, M.ASCE, Shannon and Wilson, Inc.
Siamak Jafroudi, Ph.D., P.E., D.GE, F.ASCE, Petra Geotechnical, Inc.
Wayne Karem, Ph.D., P.E., PG, D.GE, M.ASCE, Vector Engineers, Inc.
Van E. Komurka, P.E., D.GE, F.ASCE, Wagner Komurka Geotech. Group, Inc.
Francis Leathers, P.E., D.GE, F.ASCE, GEI Consultants, Inc.
Guoming Lin, Ph.D., P.E., D.GE, F.ASCE, Terracon Consultants, Inc.
Dakshana Murthy, Ph.D., P.E., D.GE, M.ASCE, RORE, Inc.
John D. Nelson, Ph.D., P.E., D.GE, F.ASCE, Engineering Analytics, Inc.
Frank Rausche, Ph.D., P.E., D.GE, M.ASCE, Pile Dynamics, Inc.
Gregory R. Reuter, P.E., PG, D.GE, M.ASCE, American Engineering Testing, Inc.
Elizabeth M. Smith, P.E., GE, D.GE, M.ASCE, Terracon Consultants, Inc.
William R. Sullivan, P.E., D.GE, M.ASCE, Golder Associates, Inc.
Woodward L. Vogt, P.E., D.GE, F.ASCE, Paradigm Consultants, Inc.
Andrew Walker, P.E., D.GE, M.ASCE, Golder Associates, Inc.
Joseph A. Waxse, P.E., D.GE, M.ASCE, Terracon Consultants, Inc.